Silicone based, waterproofing, impregnating agent, with solvents. It remains clear. It does not create a surface skin and its high penetrating ability (micro technology) ensures the breathability of the substrate. It highlights the natural grain and veins of stone. It creates the ‘permanent wet’ look on the surface. It also protects the grout of the stone lining from moisture and possible deterioration due to frost, water absorption, and consequently the appearance of salts. It offers immediate and long lasting protection. 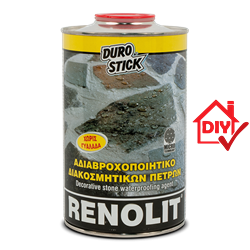 Renolit waterproofing agent is suitable for natural or artificial stone linings, on walls and floors, both indoors and out. Protects the grout of the stone lining from moisture and possible deterioration due to frost, water absorption, and consequently the appearance of salts. Mud rain, air pollutants, nicotine and soot from fireplaces, are easily removed from surfaces where two coats of Renolit were applied. 150-300ml/m², depending on the absorbency of the surface.